The Marmot Review showed that poor health does not arise by chance and is not simply attributable to genetic make-up, unhealthy lifestyles and a lack of access to medical care, important as these factors are. Differences in health reflect the differing social, environmental and economic conditions of local communities. The influence of these “wider determinants” on health requires preventative policy interventions focused on the root causes of ill health. Tackling these conditions determining people’s health outcomes requires action well beyond the influence of the NHS and health services. Thus there is an opportunity for environmental sustainability specialists to engage with health professionals around projects aimed at addressing the environmental determinants of health. Changes to the physical environment of communities should be planned so that they facilitate the conditions and the lifestyles that lead to improved health outcomes and reduced health inequalities. To achieve this, local authority planners need the support of others, including both health professionals and environmental sustainability specialists. Working together should enable the planning of win-win solutions that are good for the environment and good for health. 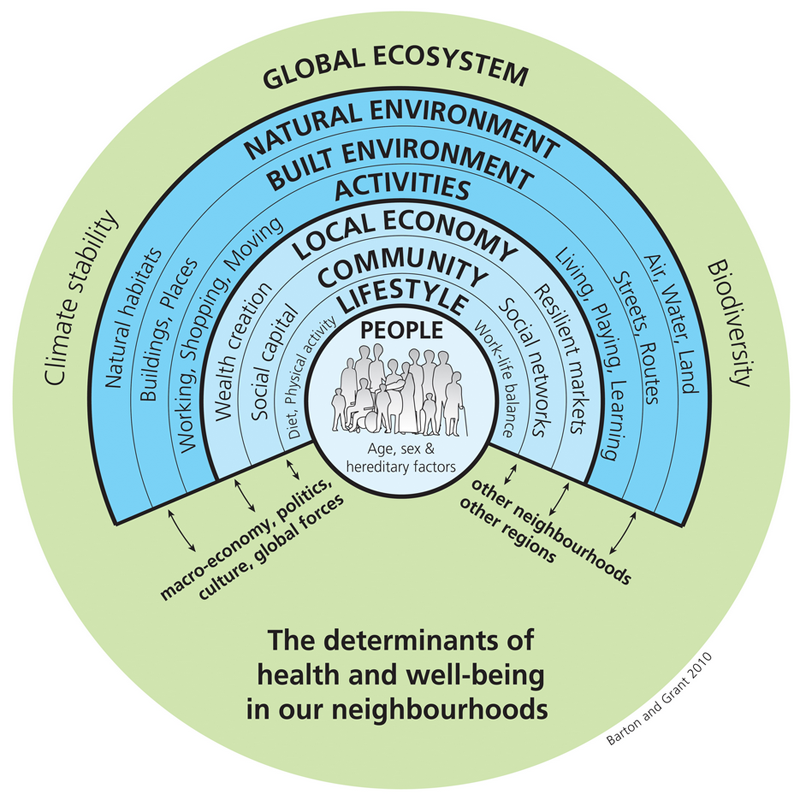 Source: Barton, H. and Grant, M. (2006) A health map for the local human habitat. The Journal for the Royal Society for the Promotion of Health, 126 (6). pp. 252-253. ISSN 1466-4240 developed from the model by Dahlgren and Whitehead, 1991.Dahlgren G, Whitehead M (1991). “The main determinants of health” model, version accessible in: Dahlgren G, and Whitehead M. (2007) European strategies for tackling social inequities in health: Levelling up Part 2. Copenhagen: WHO Regional Office for Europe.